The newly named, 6 LED "Night Vision" PowerCap™ from Panther Vision™ combines 3 Green LED's and 3 Ultra Bright white LED's to provide the "ultimate hands free torch" while protecting your night vision! When you need light, just click the switch hidden on the underside of the brim. The "Night Vision" PowerCap™ uses patented C.U.B. (Concealed Under Brim) Technology™, which combines LED's UNDER the brim for up-close tasks and Ultra-Bright LEDs under-the-brim for long distance lighting. One Green switch to protect your night vision, which can be quite handy when fishing or hunting while doing tasks in the dark. Low Beam White for up-close tasks. One White switch for ultra-bright low and high beam. Premium, 6-panel structured cap *, premium comfort headband and durable Velcro closure. One Size Fits Most. 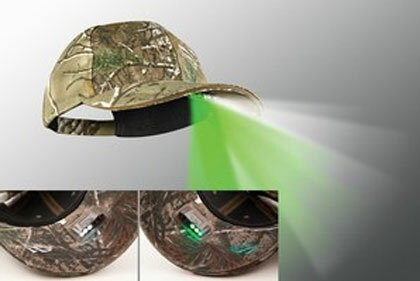 3 Green LEDs concealed under the brim preserves your night vision and will last for 100,000+ hours. Exclusive double on/off lighting technology lets YOU choose the light that is right for your specific needs. Provides light over 15 meters (50ft) away and can be visible from over a mile.